The eggs have 7 day duration and will disapear after the time expires, the eggs can be used to hatch a new pet or to feed already hatched pets. 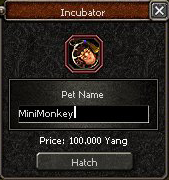 When you click with the right mouse button on a Egg, a new window will open called "Incubator" where you can chose your pet name. This will cost you 100.000 yang. Pet names need to have between 4 and 20 characters. If you do not input a name, a default one will be assigned. 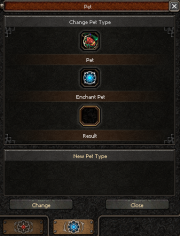 To access pet user interface you can press "P" on your keyboard, while pet is active, or you can press the button between the "4" and "F1" shortcuts, in this case 2 buttons will appear, one for the alchemy system and the other to the new Pet User Interface. Icon: Top left, shows the icon of the seal. Identify Pet Button: Top left, allows you to see what pet type the summoned pet is. Level: Shows pet current level (pets can reach owner's maximum level (1-105). Experience: Shows the ammoutn of experience the pet has. Age: Shows how old the pet is. Duration: The red bar chows how much time the pet as left, it refills when pet is feeded. Feed: Button that opens the feeding window. Evolve: Button that opens the evolve window. Item EXP: Button that opens the window that allows pet to consume gear in order to fill the last 10% EXP of each level. Bonuses: Bonus given by pet when active. Bonuses percentages increase randomly with stage, age and level of pet. Pet duration can be consulted in the red bar visible on pet interface, or on mouse over on the pet seal. *Pet duration is random and is set when hatching the pet. Pet duration cannot be increased, it can however be refilled by feeding the pet. Normal pets duration is from 1 to 14 days. Meley pet can have 48 days duration. All Eggs and pets (live and dead) can be used as food for your pet. When feeding with eggs and pets, the duration of your pet will be refilled 3% to 5%. Protein Snack will refill your pet duration to 100%. When the duration of a pet expires, it will die. Protein Snack the pet will be revived with 50% of it's duration refilled. If a pet is revived he will keep his bonuses and skills, but his age will be reseted. Pet can reach the same level as the player, to a maximum of 105 at the moment. If the pet is higher level than the player it cannot be activated but it can be kept on inventory anyway. Each time the pet reaches a certain point of exp (22.5, 45, 67.5, 90% and 100%) you will see an effect, similar to when players are leveling. On each level you are required to fill 4 red balls, 90%, by killing mobs, and the final blue ball, by sacrificing items to fill the remaining last 10%. The ammount of Item EXP obtained from each item varies according to the NPC price of each item. You can fill the blue balls before the red are complete, exceding Item EXP will be stored for the next level. Pet can loose EXP uppon death of the player. (Needs confirmation). Pet skils are unlock on the last stage, the number of skills unlocked is set upon hatching of the egg and can be 1, 2 or 3 skills. The skills can be active or passive. Passive skills are always present and it's effect is displayed on top left corner with an icon. Active skills are triggered automatically on specific situations, active skills have cooldown. You can choose the pet skills by reading the wiched Pet Skill Book. Skills can be evolved up to level 20. There are 23 different skills to chose from! Light as a Feather Book After learning this skill, your pet has the Feather Walk hability. Eagle Eyes Book After learning this skill, your pet increases the EXP you gain. Master Brewer Book After learning this skill, your pet increases the effectiveness of regeneration potions. Monster Hunter Book After learning this skill, your pet increases the effectiveness of strength against monsters. Life Drain Book After learning this skill, your pet gives you the hability to absorb HP from monsters killed. Pet doesn't have HP, SP or any stat values. Transport Box pet can be tradable for a 30 day period. Only one pet from this system can be used at any given time, but it can be used along with 1 pet from the old system. Pet cannot take any damage. 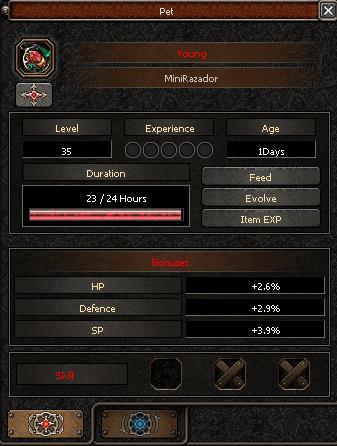 Bonus, number of skills, pet size is generated randomly. Pets change size and colour when evolving stages. This page was last modified on 29 November 2018, at 15:59. This page has been accessed 257,964 times.